When it comes to prepping for natural disasters and other types of SHTF or grid down situations, much of the gear and supplies you might need will be very similar to what other people need in the same situation. The key focus for pretty much everyone is to make sure physical needs are met first. This means the gear and supplies you stockpile should be focused on helping you to have or secure clean air, food & water, and shelter from the elements. But one thing many of the survival and prepping sites overlook are that there are many different types of preppers with special needs. These preppers not only need the standard gear and supplies everyone else needs but because of vulnerabilities due to age, mobility issues, disability, or chronic health problems, they need something more. If you have a baby in your group, whether it’s your child, your grandchild, or the child of someone in your mutual assistance group or neighborhood, you need to prep a bit differently. Babies have multiple physical needs that must be met. They are more vulnerable to the inadequate nutrition and physical discomfort that are an expected part of a SHTF or bug out situation. It’s important to stock up on things such as formula, baby food, diapers (cloth if possible), extra clothing, extra blankets, and baby wipes. Comfort items such as a pacifier or favorite blanket could be critical to keeping them calm and quiet when the need calls for it. The health of a baby can also change rather quickly so it will be critical to include first aid supplies to help you monitor fever and be prepared to treat issues such as dehydration or diarrhea very quickly. Preppers with babies should make sure to include several thermometers, infant fever/pain reducer, and pedialyte or another electrolyte replacement for babies, in their stockpile or bug out bag. When it comes to a disaster, SHTF event, or bug out situation, many kids can get scared or overwhelmed easily. One of the best ways to prepare kids for a stressful situation is to have emergency plans in place and include your kids in practice drills. Kids who have been drilled to respond in specific ways during emergencies will feel prepared and will be more confident that things will turn out okay. Many kids will experience less stress and anxiety if they have an idea of what to expect and a plan of action. Helping kids to remain calm is one of the reasons public schools practice tornado and fire drills. Prepping for a family that includes kids means taking into consideration that a bug out may take longer. Kids will likely need more frequent rest breaks and will move slower than the average adult. They may not be able to travel as many miles at one time. Kids that are tired, scared, or hungry will be less cooperative and more prone to acting out. Preppers who have children and are preparing for an evacuation or a bug out will need to factor all of these considerations into their planning. On top of the special accomodations preppers with kids need to take into consideration might be additional things to consider when prepping for kids with special needs. These can include kids with autism, sensory disorders, Down’s syndrome, and many others. Many kids with special needs find comfort in routine and structure, two things that will definitely be impacted during a SHTF or bug out situation. If you are prepping for kids with special needs, you will need to place a particular emphasis on maintaining routine as much as possible. Make sure that you stockpile or plan to have multiple things on hand to comfort and reassure your child including special toys, blankets, cups, or foods. Lighting is important for those who are older who may not see well even in daylight hours. Make sure you or your loved one has battery powered or solar powered lighting that they can access and easily turn on. Keep bottled water accessible to them in areas of the home where they spend the most time. Elderly can suffer from dehydration because they are afraid to get up and move around in the dark or to try and locate food or water. Elderly are considered preppers with special needs because they just may not move around or think as quickly as younger preppers. Some elderly may have trouble operating life straws, water filters, or hand crank flashlights due to arthritis or other ailments. Any gear or supplies that you get for elderly should take into consideration their physical limitations as far as strength or altered mental capacity. The elderly can also be more susceptible to the nutrition changes during a SHTF or bug out situation. It’s a good to stockpile diet supplements such as Ensure which can help them get the nutrition needed to maintain their energy levels. There are a wide variety of disabilities that can affect your ability to prep. It’s important to understand your disability and be familiar with how that disability may impact your prepping. Having a disability does not mean that when SHTF you are simply out of luck. What it does mean is that you may have to work twice as hard prior to a SHTF event to find a way to accomodate or plan for your disability when the time comes. Often, people with disabilities such as blindness, partial paralyzation, or missing limbs can strengthen their other senses and skills to accomplish the same tasks in a different way. A prepper who is blind may work to develop their sense of hearing and smell or practice using a service dog who is trained to get them out of danger. Preppers confined to a wheelchair may need to turn their wheelchair into a bug out vehicle of sorts by adding all terrain tires and other accessories to help them carry their gear in a bug out situation. 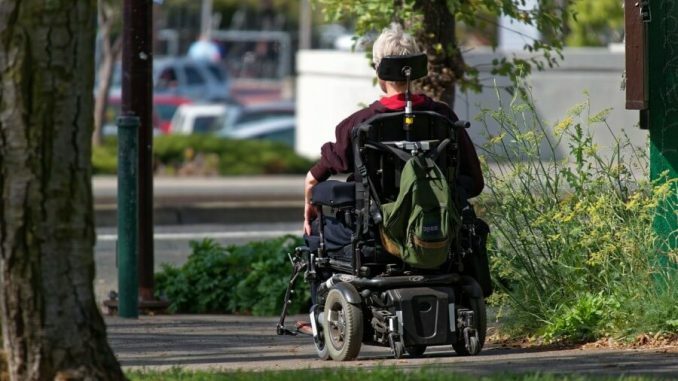 Those preppers who use a motorized wheelchair or who need a walker or can to get around normally may need to put more effort into maintaining their vehicle or developing upper arm strength to mobilize a manual wheelchair so they do not have to bug out on foot. Keep in mind that the doctors and pharmacy that you rely on to help monitor and treat your condition may not be readily available during a crisis. Make sure you know how to either monitor your condition yourself manually or recognize the triggers or symptoms of your condition without an electronic device or doctor’s assistance. If monitoring or treating your condition requires electronic monitoring, store a spare device in a faraday cage and plan for backup power needs. Prior to a SHTF or bug out situation, talk to your doctors and ask questions about your specific medical condition or disability. Research your medical condition so that you thoroughly understand the treatment you need and how it works with your body and your specific condition. Make sure that you know what each of your medications are and why your doctor has prescribed them to you. Many medications are used simply to treat inconvenient or irritating symptoms. Other medications are more critical to your survival. It’s important to know which medications will make you uncomfortable if you stop taking them and which ones will put your life at risk. You’ll also want to stockpile or find alternatives for any special supplies you need for your medical condition. This can include things such as catheters, incontinence supplies, feeding tubes, and oxygen tanks. Always consult your physician about your specific medical condition prior to starting any kind of natural or alternative treatment. What works well for your neighbor’s medical condition may work differently for you. Once you know what you will need to treat your medical condition or at least slow its progress during a SHTF event, make sure you stockpile those medications. If prescription medication is your only option, try to participate in a 90 day prescription plan so you always have medication on hand. You can also talk to your doctor and explain your fears in a grid down situation and ask for an additional prescription that can be rotated into your stockpile. Use autoship options to have medications delivered as soon as insurance companies will allow it. This will sometimes be several days prior to your subscription running out which means you will have a couple days of pills to stockpile. If you have to skip a dose of medication due to a surgery, hospitalization, or simply forgetting to take it, save those pills to rotate into your stockpile. If there are alternative medications, even if they won’t work as well, add those to your stockpile along with any natural alternatives. For example, CBD oil has been known to help with many different medical conditions. You may not be able to take this on a regular basis, especially if you are drug tested for your job, but you can certainly stock it and use it in a SHTF situation if there is nothing else available. For those who have equipment that requires power, it is even more critical to take an inventory of your power needs. Invest in backup batteries, a generator, or even solar power to keep your equipment functioning when you need it. For sensitive electronic equipment, you may want to invest in backup equipment that you store in a faraday cage. No matter how diligently you prepare, preppers with special needs must also prepare to make difficult decisions. There may come a time when preppers with special needs are not able to evacuate or bug out safely or may run out of supplies needed to maintain their health. 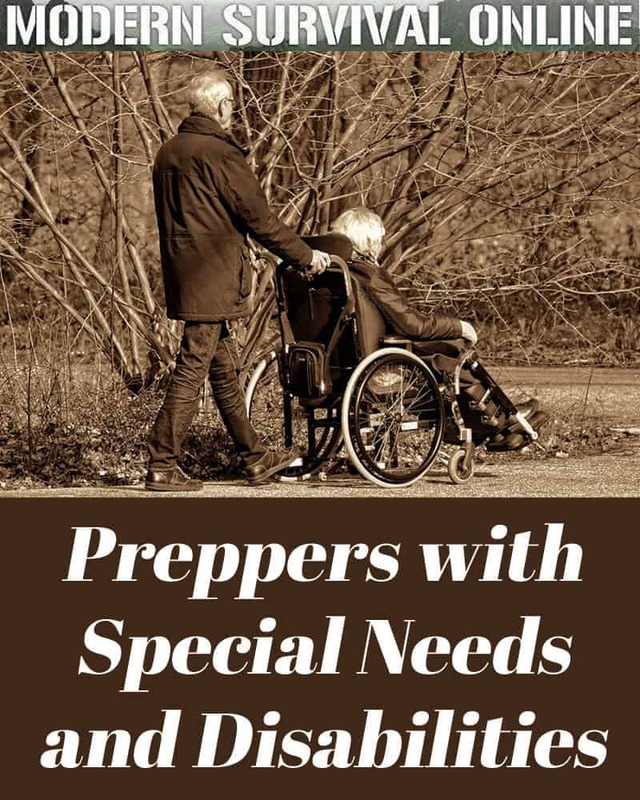 If that time comes, preppers with special needs will be able to more quickly and confidently make a decision if the topic has been discussed in advance with all involved. Elderly parents may not have the energy or desire to leave their home even if it means they may die sooner. Evacuating or bugging out with kids with multiple special needs may not be feasible if your vehicle is not operational. Plan as much as you can for alternatives but discuss with one another what will happen if one or more of the group is unable to evacuate or continue to move toward safety. With advanced planning, you can boost the odds that preppers with special needs can survive a SHTF or bug out situation. Unfortunately as with any crisis situation, there are no guarantees. All you can do for your loved ones or yourself is to invest the time to thoroughly plan for whatever life may throw at you and hope for the best. Thanks for the article for all of us with limitations. I hope there will be more to come. Many of us have valuable skills and knowledge that would be useful in those special times that would make extra effort of the able folks worth it to keep us with you others. So. Like you briefly mentioned again. Discuss, plan, and practice.